This is the sort of place I wouldn't usually look twice at - stripped floors, dim lighting, candles on tables etc. not my concept of a pub at all but I found myself here for no other reason than the live music. Main bar is quite spacious but with plenty of seating and there's quite an eclectic choice of beer, some keg, some on handpump. There's another bar downstairs where the bands play with just keg beers, albeit from local micros. Drinks are definitely on the pricey side but then we had front row seats for two superb bands at no extra cost so pound for pound excellent value for money. Jolly nice pub with lots of beer and lots of live music. 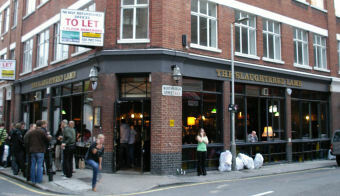 A nice corner London pub, with a little bit more to offer than most. In the main room there is a single large central bar, with a fantastic beer choice. Four real ales, including some from the Camden Brewery alongside a great selection of draught beers, lagers and European imports. There is a range of seating, tables, benches, sofas etc. Food is served, simple and pleasant pub classics like bangers and mash and fish and chips. Downstairs there is a second smaller room, with a little stage for live music. Music seems to be a regular feature with a few gigs every week. Overall a great place to spend an evening. With a name like this you'd be prepared for burly Yorkshire farmers with silver tankards quaffing foaming Black Sheep bitter and mounted animal heads on the wall but with the dark tinted windows outside you'd be expecting a trendy lads pub with 4 different types of popular lager. Neither is true. It is of the trendy wooden floorboards, tables and chairs variety but happily the beer is from Camden brewery. I tried the Camden Town Wheat Beer which could have been a cross cultural disaster but was so lovely I could almost chew it (slightly too cold though) Soundtrack - obscure Presley and 'The Unknown Soldier' by the Doors. Approved (stamp hits the page) Only quibble was �4.20 for the pint. Good choice of beers and a couple of real ales. Can get busy and there are always lots of tables reserved. Visited on a quiet Saturday afternoon. Great ( tho expensive) range of beers on tap and decent enough sandwiches. Good music and laid back atmosphere. The service however was like nothing I've ever seen before. Girl behind the bar was Definately on another planet. Slow and about as enthusiastic as a man being led to the electric chair. I swear she sighed as she banged down our cutlery at our table. Like a teenager being forced into household chores. Was so unreal we couldn't help but laugh. Not enough here to tempt me back I'm afraid .